="Letort Spring, Bonny Brook, Carlisle,Cumberland Valley Railroad,Reading Railway, Pine Grove Furnace, Mt. Holly Springs, South Mountain Railroad, Gettysburg & Harrisburg Railroad"
East End of Carlisle. From Atlas of Cumberland County F.W. Beers, 1872. .
Cumberland Valley RR crossing at the Carlisle Barracks Golf Course. At this crossing looking west is South Mountain Junction. CVRR's new alignment swings sharply to the right as compared to the map above (the map's alignment is when CVRR went down the middle of High or Main Street of Carlisle). 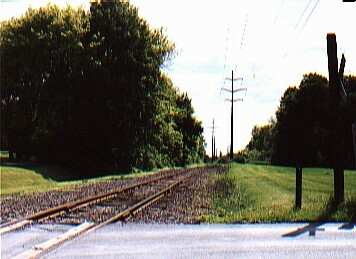 The original CVRR line and later the defunct South Mountain goes straight, as marked by the power line. Newspaper photo courtesy of Cumberland County Historical Society. 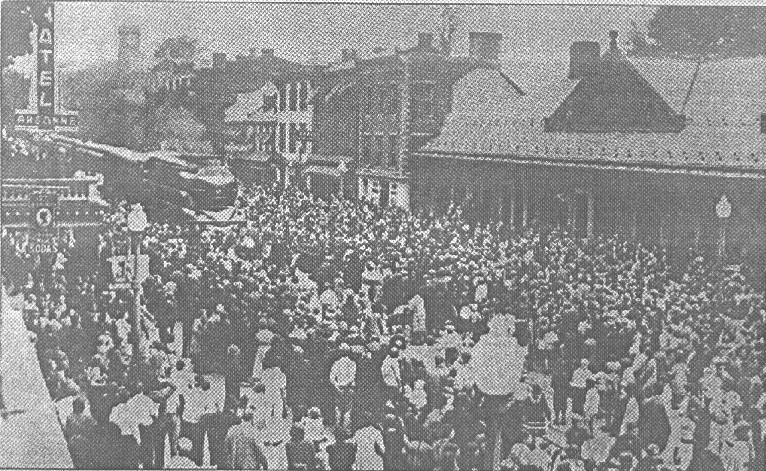 October 17, 1936 was the date of the last train down High Street of Carlisle. The caption states trains were using the main street through the Cumberland County Seat for more than 90 years. 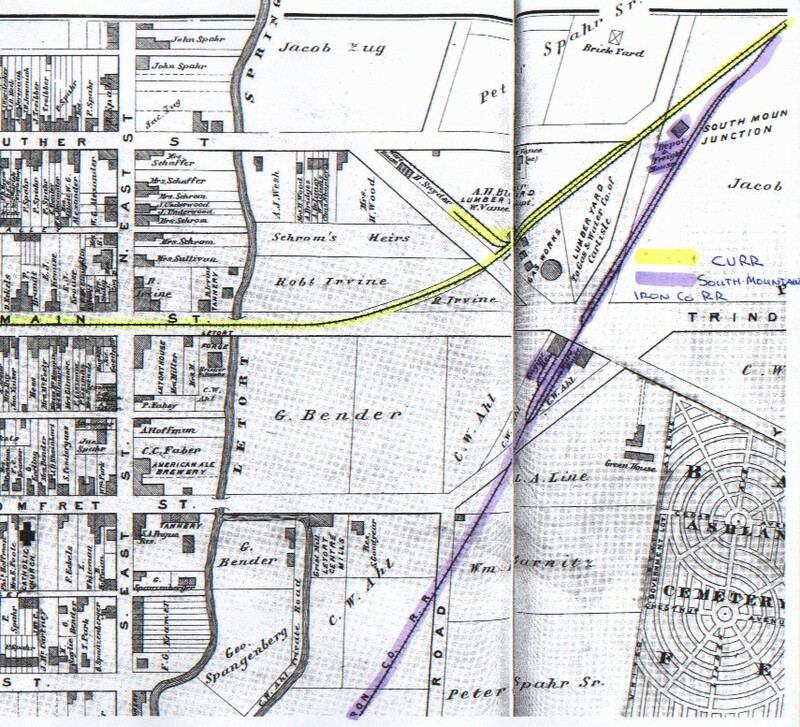 According to the 1906 timetable, the speed limit down the street was 8 miles per hour, which seems slow but was actually faster than 5 other valley towns which did not share the main street with the tracks. Hagerstown Maryland, probably to spite the PRR, was the slowest at 4 miles an hour. These town with speed limits and grade crossing were serious obstacles to running a freight railroad, espcially in the Coal Push days. 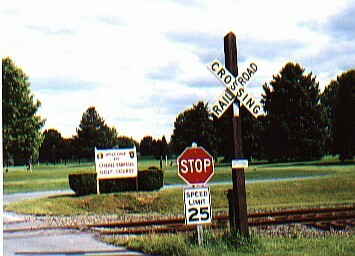 The CVRR built bypasses around several towns including Carlisle. From Beer's 1872 Atlas of Cumberland County. Note the engine facilities on the west side of Carlisle seem to be outside of the city limits. 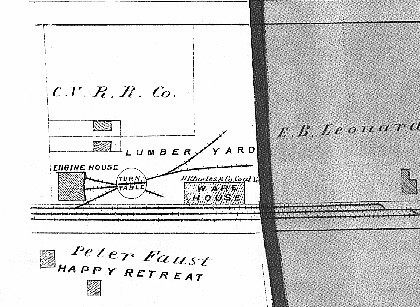 Everyone has different opinions about steam railroads, so one wonders whether Peter Faust named his farm Happy Retreat before the railroad located operations across the street.